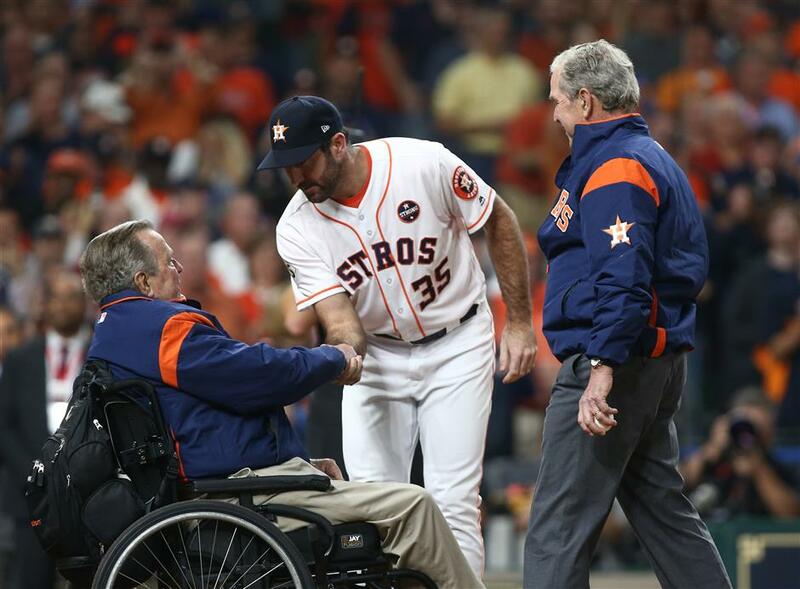 Houston Astros pitcher Justin Verlander greets former US presidents George HW Bush and George W Bush after the ceremonial first pitch in Game 5 of the 2017 World Series against the Los Angeles Dodgers at Minute Maid Park in Houston, Texas, on October 29, 2017. Home runs kept flying over the wall at Minute Maid Park, on line drives up toward the train tracks, on fly balls that just dropped over the fence. Seven more were hit in Game 5, raising the total to a World Series-record 22 — with two possible more games to play. Twenty-five runs were scored in a game started by the Dodgers' Clayton Kershaw and the Astros' Dallas Keuchel, Cy Young Award winners regarded as among baseball's best. "The main complaint is that the balls seem a little bit different in the postseason, and even from the postseason to the World Series balls," Justin Verlander said on Sunday, two days before he takes the mound in Game 6 and tries to pitch the Astros to their first title. "They're a little slick. You just deal with it. But I don't think it's the case of one pitcher saying, 'Hey, something is different here.' I think as a whole, everybody is saying, 'Whoa, something is a little off here'." A record eight home runs were hit in Game 2, including five in extra innings, and Game 5's seven long balls would have tied the old mark. The 13-12, 10-inning Astros' win on Sunday night was the second-highest scoring game in Series history. Same for Kershaw, even after giving up his record eighth homer of the postseason on Sunday. "I know there was talk about different sizes and some of the baseballs were slightly bigger and some were smaller. Some of the seams were higher, some of the seams were lower. But, no, it's been consistent," said Rich Hill, who will start Game 6 for the Dodgers. "I think that just has to do with conditions — if it's colder it's going to be slicker. If it's a little bit warmer out or humid, I think you're going to find that you're going to have a little bit more of moisture to the baseballs." "I'm absolutely confident that the balls that we're using are within our established specifications," he said on Friday. "I know Mr Manfred said the balls haven't changed, but I think there's enough information out there to say that's not true," he said. San Francisco's Johnny Cueto and Toronto's Marcus Stroman also think the balls have changed, with Stroman blaming slick balls for a rise in pitcher blisters — an affliction which has struck Hill a few times in the past couple seasons, too. "Everyone is entitled to their opinion," Astros manager AJ Hinch said. "I don't see a ton difference, but I'm not going to get in a verbal war with coaches and players who think otherwise."